The galaxy of ‘literary’ science-fiction is a relatively small one, but its brightest star by far is Alastair Reynolds. Terminal World offers a highly original narrative, characters that are morally and psychologically complex and, best of all, a story that is told through accomplished and sophisticated writing. 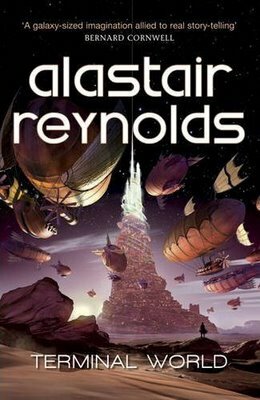 Reynolds’ seemingly effortless prose is abundant with creative, diverse metaphors, witty dialogue and acute situational observations; factors which are so often lacking in science-fiction writing. Then again, to even call Terminal World a Sci-fi novel is to be brash with genre assumptions. The book is devoid of spaceships, aliens, other planets; in fact, it’s without any of the defining tropes of science-fiction. The crux of the novel is the atmosphere-piercing city of Spearpoint – a towering metropolis divided into the ‘zones’ – layers of the city each with their own technological limitations. Thus the base of Spearpoint (horse town) is almost medieval; the next layer (steamville) is early-industrial in its scope. The ‘zones’ advance in this way until the city’s very highest ‘Celestial’ levels, in which winged post-humans manipulate nano technology and can cure any ailment. The technology of the ‘zones’ isn’t enforced by governments or clerics, but by the nature of reality itself in this far-future vision of Earth. This plot device enables Reynolds to enjoy an unusual amount of freedom in terms of setting and characterisation. 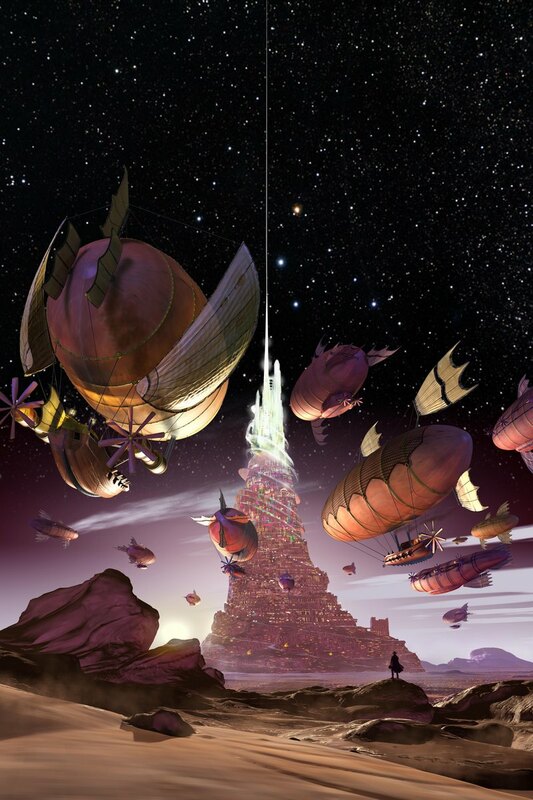 Terminal World is very odd sci-fi; a smorgas-board convergence of steampunk, fantasy, planetary romance… the novel even borrows from pirate, naval and military genres. Crucially, though, the brilliantly original setting isn’t ancillary to the plot in anyway – it’s unusual, but the setting is the plot; I thought that the concept of the ‘zones’ permeated the narrative in fascinating ways – allowing deep exploration of social, moral, psychological and cultural themes. Which leads me to the book’s characters. The majority of whom I found to be convincing, if unusual. Alastair Reynolds is often criticized for a lack of complex characterisation; and I agree that several of his early works centre upon…mannequin personalities. Any such problems have been addressed and overcome here. I thought Quillon, our protagonist, to be a wonderfully bizarre and captivating personality – faced with multifaceted moral dilemmas throughout, he is constructed sympathetic to the reader (gonna get technical for a second here: the prose is formed in ‘indirect free-discourse’, so although it’s framed in the third person singular, the viewpoints of Quillon and the reader are converged); he is physically feeble yet intellectually firm. I don’t want to give too much away regarding the actual story – suffice to say I found it very original and, like Spearpoint itself, built upon many layers of differing complexity – fast-paced battles and events play out around complicated politics; plus Reynolds offers a very witty and fresh take on the old fantasy cliché of a ‘chosen one’. Its themes are numerous and engaging – from the philosophical nature of history to cartography and the politics of leadership – there’s a lot going on; even, I believe, some convincing attempts at allegory. The final revelations come thick and fast – with the eventual explanation of the true nature of the ‘zones’ offering a mind-blowing denouement to the action. If you’ve ever read anything by Alastair Reynolds, you’ll know that he’s a true master of ‘endings’ – always shocking, never sweetly resolved or cliché and perpetually, relentlessly creative. Clearly I thoroughly enjoyed Terminal World – it’s brilliantly well-written, and, in my humble opinion, a genuine and successful attempt at sci-fi literature. Finally, I’d just like to comment on this novel’s exceptional cover art. I normally regard jacket artwork as neither here-nor-there (especially in sci-fi, a genre plagued by clichéd and over-used imagery), but Chris Moore’s painting for Terminal World is a truly striking visual interpretation of Reynolds’ idea. Spearpoint towers over the other figures and illustrations; in much the same way as the fictional city dominates the narrative landscape of the novel, ‘like God’s own hard-on’ – as the author wryly puts it. This entry was posted in Novels, Reviews and tagged Alastair Reynolds, science fiction, Steampunk., Terminal World. Bookmark the permalink. So there’s a tower with different layers of people who are at different levels of development, but rather than being strictly enforced it’s self-enforced? Are they connected by an elevator or stairs or something of the like, or are they more just stacked one-on-top-of-another? Are they all aware of one-another?